Ladies, this one’s for you. 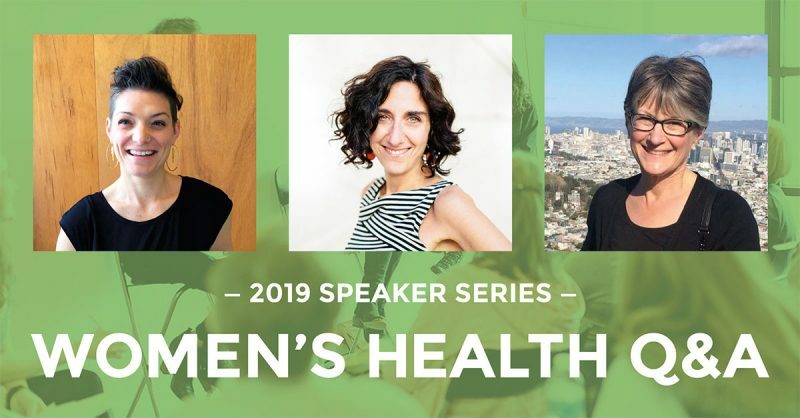 Join us March 3 for a panel discussion about women’s health. We’re bringing together three of the best women working in healthcare to answer all your questions. This event is a popular annual tradition at the studio taking place each March as we celebrate Women’s Health month. Whether you’re wondering about hormone balancing, stress management, pelvic floor exercises, cholesterol and heart health, risk factors exclusive to women, postnatal life, perimenopause/menopause or when to get a mammogram, we’ve got you covered. Join us March 3 for a panel style Q&A featuring chiropractor Nicole Wilson, naturopath Samantha Brody and retired cardiologist Alison Fulmer. Come with your questions or send them confidentially in advance. Dr. Samantha Brody is a licensed naturopathic physician, acupuncturist, and owner of Evergreen Natural Health Center in SW PDX. he also runs a virtual arm of her business doing coaching and consulting with clients across the globe. Her new book Overcoming Overwhelm: Dismantle Your Stress from the Inside Out was recently released by Sounds True Publishing and is available wherever books are sold. When she’s not seeing patients and clients, you can find her speaking and writing on women’s health, stress, nutrition, and integrative medicine. She has been a featured expert in many publications and blogs including the Wall Street Journal, Shape, Livestrong, Huffington Post and more. You can find her online at www.DrSamantha.com and on social @drsamanthand. Hyatt Training members, please email us at Go@HyattTraining.com to reserve your spot!